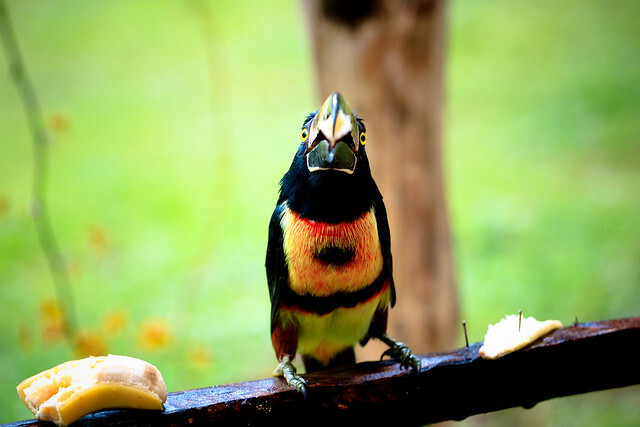 The Collared Aracari is a colorful bird that resides year-round in the jungles of Mexico, Central America, and northern South America. It is a toucan and has a distinctive long bill that is almost a quarter the size of the bird itself. It is a very social creature and usually found in flocks of 6 - 15 birds. An adult bird is around 16 inches in length, with its bill accounting for about 4 inches, and weighs approximately 230 g. Male and female are similar in appearance, each with a black head and a colorful chest of red, green, and yellow feathers. Juveniles are much duller in color compared to their adult counterparts, with paler underparts and a less distinct bill pattern. Although the Collard Aracari is primarily an arboreal fruit-eater, it will also feed on bird eggs and small prey like insects, lizards, and fledgling birds. This near-passerine bird occurs from southern Mexico to Panama, but also extends into Ecuador, Colombia, and Venezuela. The bird makes its home in the tropical rainforests of southern Mexico and throughout Central America. It is also a common resident in lowland forests and will often nest in natural cavities or old woodpecker nests. A female usually lays 3 - 4 eggs per clutch in an unlined nest. Both male and female incubate the eggs for a period of about 16 days. The young will leave the nest at 40 - 42 days.